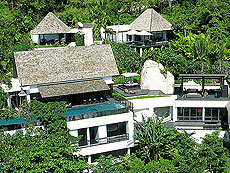 Villa Yin is a high quality rental villa nestled on hillside of Kamala cape. Inside the villa decorated mixes elements of classic Thai architecture and a collection of contemporary art with luxury design. From the 18 meter of marble pool could see panoramic ocean view of Andaman Sea. Full time Chef, Daily housekeeping, and concierge will take care of your villa stay much more comfortably.